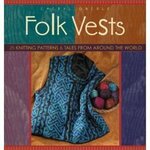 The cottonwood vest is from Folk Vests by Cheryl Oberle. I am making out of Siena merino from Rödel in color 9906 which is a kind of burgundy for the main color. 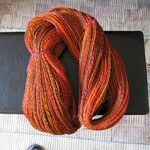 The contrast color is the fire corriedale that I just finished spinning. After spending a small amount of time swatching, I wound up adjusting the pattern significantly, since I don’t want a vest that is all that big around, and the gauge that is best with this yarn combination is 6.222stitches/per inch. This will give me four repeats of the pattern on each front and 8 across the back. 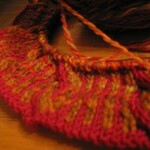 Since this is knit in the round with steeks, I just have to make sure that I keep everything lined up. 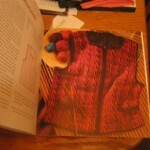 I will cast on 9 April for the facing on 4,0 mm needles before going up to 4,5 for the body of the vest. 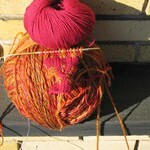 One of the other reasons for being so careful is that I only have the 500 meters of handspun. After that I am out of luck. Yet another orphan sock – 2005? Bavarian Twisted Stitch Socks 2001? 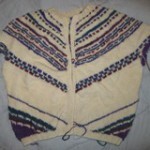 Then there is the odd ball cardigan I started to use up handspun. The difficulty is that I have several skeins left of handspun, but I am out of the white (commercial yarn). Now, I can just turn it into a bit of a wierd vest, or find some more white. This decision hasn’t been made for well over a year. And then there are those projects that really are UFOs. If I get the camera out and do photos, posting them perhaps it will be the boost that I need to finish off a few more? 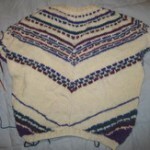 This project is Janet Szabo’s Shawl Collared Aran and here rather than above because the whole thing is handspun. Started with remainders from Brown Sheep. The White&Brown was spun into a single, then plied with a single from the cream mixed roving. that I think I have more than enough yarn spun, but have not touched the knitting since last winter. I might actually like to wear it sometime before spring. The only problem is that I have to find the pattern. I have the charts where I have substituted cables, but I am missing the saddle cable and the basic directions. OTOH, I can probably make it up from here, since this is a top down sweater and I just need to keep going till it is long enough + ribbing. 15 Feb 2007 – Since the Nußloch Spinzirkl met tonight, I took the opportunity to spin another bobbin of singles. That almost completes the fine white&cream blend ply that I will need. I promised to bring it along next time ~1 March, so I am planning on getting at least one sleeve done by then. I only started it in Jan 2005….